Toronto drivers were issued fewer parking tickets last year and of those who did get nabbed, more were able to get out of paying them, a new city staff report says. 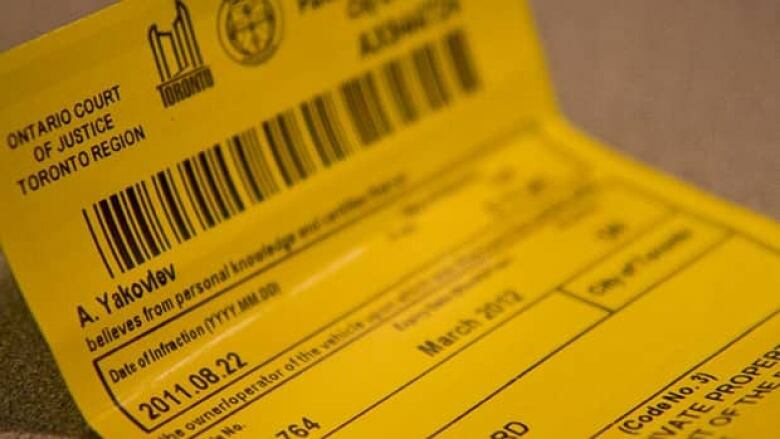 The City of Toronto issued 2,761,802 parking tickets in 2012, worth about $94 million dollars in revenue, down 2.5 per cent from a year earlier. But drivers beat the rap on more than 22 per cent of them, or 633,108 tickets, last year. That's up from the previous year, when 17 per cent or 493,185 tickets were cancelled, the report says. "This is a big revenue lost for the city," Coun. Joe Mihevc told CBC News. "We need that money." Toronto parking officials say the number of tickets being issued have dropped, in part, because officers are more often tasked with other duties, such as helping relocate vehicles at public events, taking time away from ticketing activities, the report says. More tickets were also likely cancelled in 2012 because the 10-minute grace period was introduced, up from five minutes. People are also becoming more familiar with the city's parking ticket cancellation guidelines and the process to fight them, according to the report, which is set to be presented to the city's Government Management Committee next month. Coun. Josh Matlow said drivers who park illegally should get a ticket but that some leniency, such as a grace period, is reasonable. "We should be enforcing parking to make sure that we protect people's safety and also make sure that we clear road allowances," he told CBC News. "Not just go after a quota." Drivers say that finding a parking spot in the city is incredibly difficult. "It is impossible really," one driver told CBC News. "Like you have to look out for the fire hydrants, figure out the signs, which way they are pointed." The largest number of tickets issued in Toronto last year were for expired parking meters, totalling 594,355 tickets. With a fine of $30 each, that's worth about $17.8 million. The second largest category — totalling 569,783 tickets — were issued to drivers who parked in prohibited zones. At $40 each, that comes to about $22.8 million. These two categories represented about 42 per cent of all the tickets issued in 2012, according to the report.